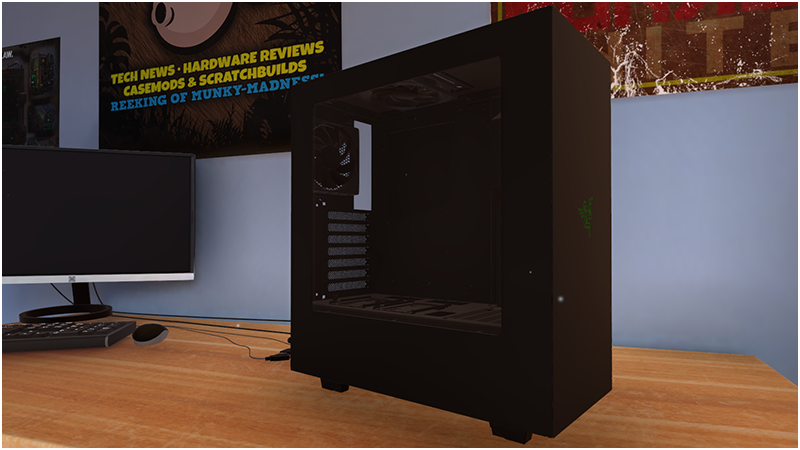 PC Building Simulator Update v0.9.1 – Razer Chroma support arrives alongside a whole host of fixes! Posted on 18th October 2018 at 11:14. If you are a fan of Razer hardware you will no doubt be aware of their Chroma lighting and should be pleased to learn that we now sync in-game PC LEDs with your real-world Razer hardware for that extra step to RGB greatness! 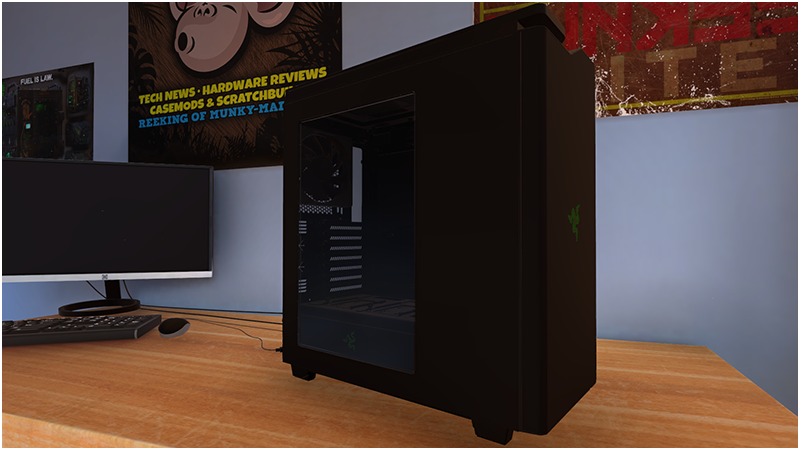 In PC Building Simulator the first LED listed in the lighting app of a built PC will automatically be reflected in colour and effect on your Razer hardware in the real-world. Added Razer Chroma support for (real-world) hardware that supports it, your hardware will take the light colour/effect from the first LED shown in the lighting app. New Cases: NZXT S340 – Designed by Razer (6) & NZXT H440 – Designed by Razer (9). 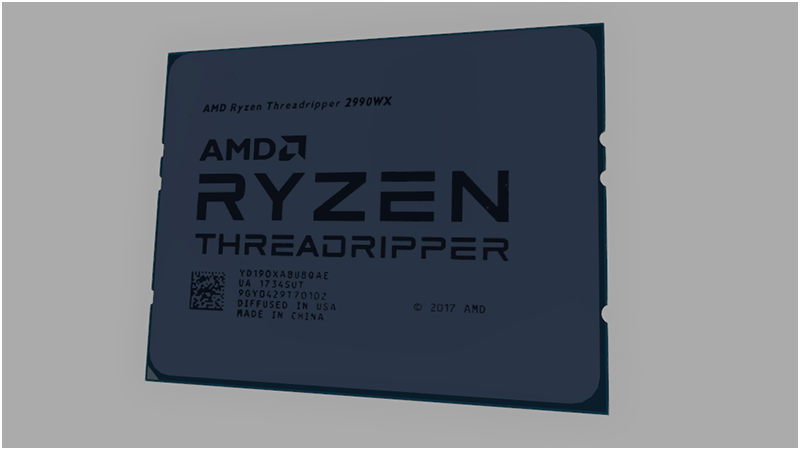 New CPUs: AMD AMD Ryzen Threadripper 2990WX (25) & AMD Ryzen Threadripper 2950X (25). New Motherboards: ASUS TUF X299 MARK 1 (24), ASUS ROG Maximus X Code (19), ASUS ROG Crosshair VII Hero (WI-FI) (18), Gigabyte GA-Z270X-Gaming 8 (11) & Gigabyte GA-AB350M-Gaming 3 (6). New PSUs: EVGA SuperNOVA 650 P2, 80+ PLATINUM (12), EVGA SuperNOVA 750 T2, 80+ TITANIUM (12), EVGA SuperNOVA 850 T2, 80+ TITANIUM (12) & EVGA SuperNOVA 1600 T2, 80+ TITANIUM (12). New Case Fans: EKWB EK-Vardar EVO 140S BB (25), EKWB EK-Vardar EVO 120ER RGB (25) & EKWB EK-Vardar F4-120ER (25). 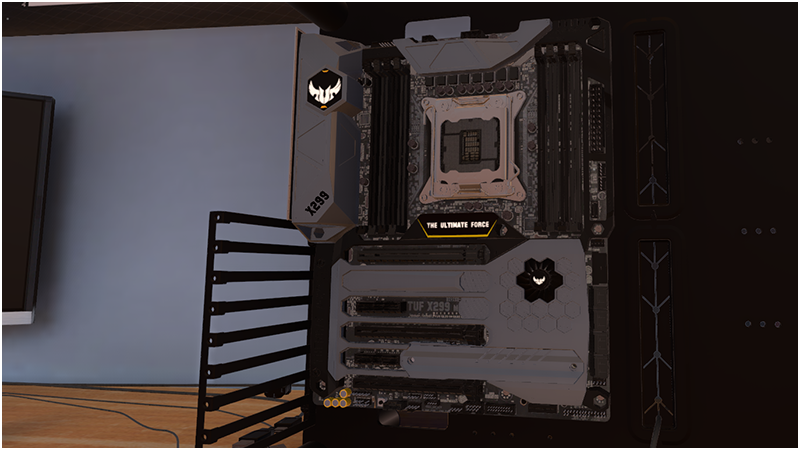 Replaced UI for ‘How to Build a PC’ mode. Adjusted texture used for coolant. Fixed the audio sliders not working correctly in the options menu. Fixed data issues that caused the EVGA GeForce GTX 1050 Ti FTW GAMING & EVGA GeForce GTX 1070 FTW2 GAMING GPUs to overheat constantly. Fixed LEDs not turning back on when changing their colours to black. Fixed lighting options on SLI bridges for Water Cooled GPUs. Changed objective text from ‘Leave by door’ to ‘Place in corridor’ to help reduce confusion over where to place a job PC when done. The first job in the game now has cabling mode selected by default rather than remove. Added missing USB drive description. Added extra first time control prompts for new players. Added plugs to unused GPU water block tube connections. The Water Cooling shop should now have a name in non-English languages. The Water Cooling shop now has a description. Added new SFX for Selling, Collecting Rewards and Upgrading office furniture. Adjusted SysInfo overlay in 3DMark to support higher amounts of core data. The default behaviour for the ‘Fits this PC’ toggle in the inventory has been changed. This is now off by default to help players learn why something doesn’t fit (rather than assuming it hasn’t been delivered or exist). The Shop and Water Cooling shop no longer share the same checkout. Water Cooling shop items no longer appear in the normal shop via the search function. Fixed an issue where using the store search option would break viewing other categories. Water Cooled GPUs now get compared correctly in Will it Run and job objectives. Fixed an issue in the NZXT S340 Elite where AIO Water Coolers would auto install into the wrong place and break. Fixed an issue on the SilverStone PS14 where it would contain 2 windows. Please note, this fix will only take effect when the case is next spawned in the world so existing cases with this issue need to be discarded. Adjusted the NZXT H700 so that you can fit Water Cooled GPUs and the reservoir. Dual Water Cooled GPUs now complete Dual GPU objectives. Removed floating model parts that would appear during Water Cooled GPU installation. Fixed an issue on the CORSAIR Crystal Series 570X RGB that stopped you installing two fans next to each other in the top slots. Fixed various rogue cables, the war on clipping cables continues! Updated the game splash screen to include Razer and new Irregular Corporation logo. We are working full steam ahead on the career mode changes we’ve previously spoken about and we hope to release these changes/improvements in a few weeks time. These changes however, have meant we needed to rework how the save games work, which means existing saves will not work once this career update releases. For people wanting to continue their existing save games, we do plan to keep a separate branch on Steam that will allow people to continue these on the last compatible release until they are ready to make the switch to the updated career mode. While this isn’t ideal, we believe the improvements to the career overall, should make it worthwhile. 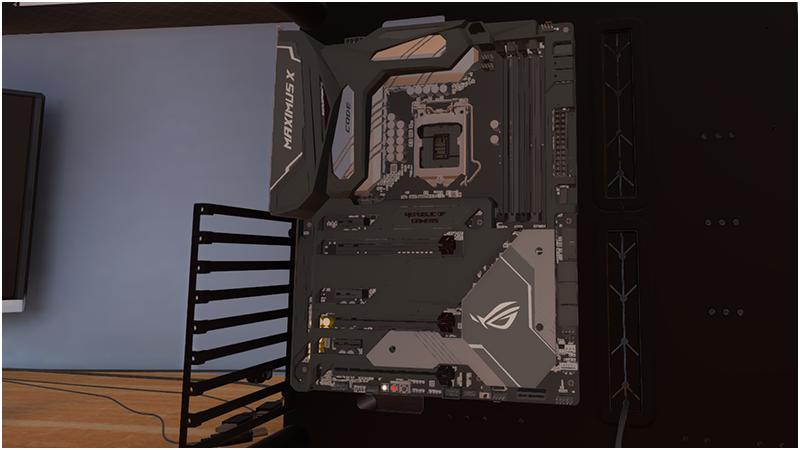 PC Building Simulator Update v0.9.3 – G.Skill speeds into your future rigs! Can you please change the room? It looks kinda old. this update is really good, good work. So I see Mini ITX and Micro ATX mainboards but no small form factor cases yet. sir, can u make this game more smooth? i play in my laptop and fps so low, i have 6gb ram, intel i5 & nvidia 630m. thank you sir. The game is smooth, you just are trying to play on a potato. Turn down your settings or get a better laptop with a newer gpu. why lvl 25 is not complete? Can you add cases from Phanteks? I would want that i can put more than one reservoir in computer case. Can you make more reservoir positions in cases? Hi guys, can you add Therlmaltake in the next update? Please add samsung, be quiet !, ASRock and rtx gpu:s! And add fictional games so you can try to get as much fps as possible on different graphics settings, that would be so fun. Jose on PC Building Simulator Update v0.9.3 – G.Skill speeds into your future rigs!